Home / calpol / events / GSK / health / himig ng kalinga / Calpol "Himig ng Kalinga"
Glaxosmithkline Philippines, Inc. (GSK), in partnership with doctor-recommended Paracetamol (Calpol) and key hospitals in GMA and Luzon, instituted the "Himig ng Kalinga" program which introduces Music as Therapy for sick children. 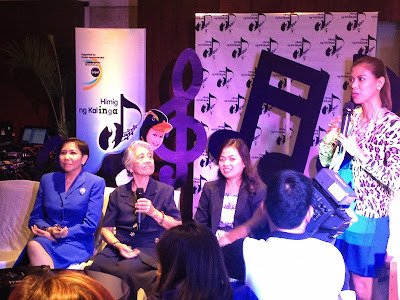 The pilot launch of the music therapy activities was led by prominent TV personality, Suzi Cabrera at the Philippine Children's Medical Center (PCMC) and Cardinal Santos Medical Center recently. Last July 3, 2013, GSK formally launched this program to raise awareness of the benefits of music therapy in improving health and healing. Music therapy is used on individuals of all ages for a variety of conditions, which include: psychiatric disorders, medical problems, physical handicaps, sensory impairments, developmental disabilities, substance abuse, communication disorders, interpersonal problems, and aging. According to the American Music Therapy Association, Music therapy is an interpersonal process in which the therapist uses music and all of its facets-physical, emotional, mental, social, aesthetic and spiritual- to help clients to improve or maintain their health. It is said that music soothes the soul. This holds true among children who are ill. Foreign health experts recommend the use of music to deliver positive changes in children's psychological, physical and cognitive development and the improvement of the social functioning of children with health or educational conditions. A theory points to the ability of music to distract a patient from pain, anxiety and stress as it enables the patient to focus on something pleasant and encouraging. When soothing music occupies the mind, it somehow allows the patient to "escape" into "his/her own world", also facilitating relaxation for the patient. The program aims to incorporate music therapy to patients and bring appropriate and familiar nursery rhyme songs to in-hospital pediatric patients that will be performed by the program volunteers. An original song written by well-known song composer, Jimmy Antiporda, entitled "Gagaling Ka Rin" will also be taught to the patients and their parents to further uplift the spirits of these hospitalized children. Doctor-recommended and mom-trusted fever reliever Paracetamol (Calpol) supports the use of music therapy to pave the way for the holistic wellness of every Filipino child. Calpol is an alcohol-free suspension with paracetamol that relieves mild to moderate fever and pain associated with headache, migraine, muscle ache, sore throat, musculo-skeletal pain, fever and pain after vaccination, pain after dental procedure/tooth extraction. Calpol wanted to cure not only the physical pain that the sick children feel but also help ease the emotional and mental pain they may feel that could assist in their faster recovery. 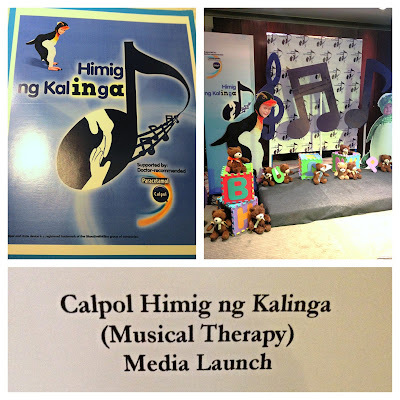 Music Therapy, in conjunction with Calpol could be an effective combination that can be used not only moms to their children but also by caretakers and health professionals to their patients.